We live in a fast-paced, on-demand, instant gratification world. Many times the expectations of a project or task can require a lot of uninterrupted work, which can lead to less sleep and lack of energy. 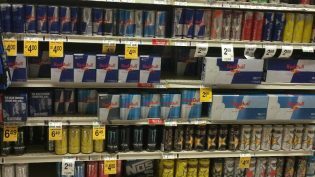 We all know that energy drinks are no stranger to the food scene. Monster, Rock Star, Red Bull, etc. are all major players. Their overwhelming success has led to a HUGE influx of smaller companies entering into the market all vying for a piece of the multi-million dollar pie. While it may seem convenient to grab a can next time you need an energy boost, we want to share some of the effects “liquid energy” can cause on your teeth. Quite frankly, energy drinks can help melt your teeth. Literally. Research studies comparing energy drinks with soft drinks have shown that energy drinks have a far more devastating impact on teeth. While both of these drinks share high sugar and acid content, energy drinks have a much greater “buffering capacity”. This means that it takes longer for your saliva to clear the substance off your teeth. The longer sugar and acids sit on your teeth, the greater the chance for decay and erosion. Usually, most people who are in a pinch for energy need all the time they have to work, meaning brushing and flossing is probably really low on the priority list. And if you are one of those people who take stress out on teeth via clenching or grinding, that’s a sure way to wear down your teeth rather quickly. Letting sugar and acid sit on teeth while preventing the body’s natural defense mechanism to do its work…let’s just say it’s a bad thing. It’s understandable that sometimes it’s hard to resist the urge. If you absolutely have to have it, we suggest simply rinsing your mouth out with some water to help wash away the sugar and acids. Chewing gum with Xylitol also helps to stimulate salivary flow (side note: Xylitol is a sugar that cavity causing bacteria cannot use). But please, do not make it a habit. Your teeth with thank you greatly!